Step 1. Gather all ingredients. Step 2. Boil water, add salt and pasta and cook for 4 minutes, drain and set aside. Step 3. In a frying pan, heat olive oil and butter over medium heat. Add garlic and chilli and fry for 1 minute. Step 4. Add prawns to the pan and cook for 2 minutes each side. Add parsley to the pan and stir.. Turn off heat and add pasta to the frying pan. Add lemon juice and toss well to coat all of the pasta in the garlic butter. Season well with fresh cracked salt and pepper. I really like to add a punnet of sliced up grape or cherry tomatoes into this recipe to give it a fresh flavour and add some vegetable in. If I was serving this to toddlers I would omit the chilli flakes but older children seem to be able to handle this amount of chilli. If the weather is warm then this Avocado and prawn salad is a great light meal. This Classic prawn cocktail is great entree for dinner parties. These Creamy garlic prawns have a touch of cream and basil and are perfect served with rice. These Fresh prawns with two dips are perfect to share with friends over a glass of wine. If you are looking to add something special to your pizza then this Garlic prawn pizza is a delicious choice. These Prawn and avocado stacks combine tabouli and avocadoes for a fresh entree. 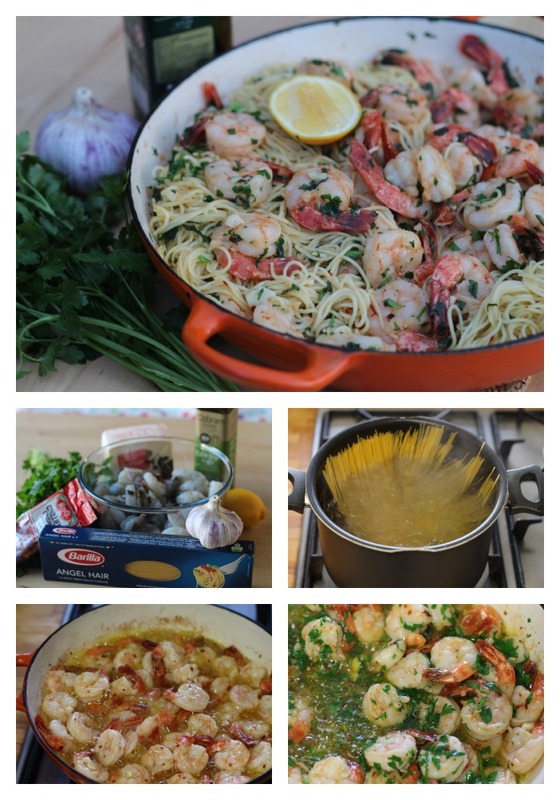 This Prawn and lemon risotto has similar flavours to this pasta but is made with arborio rice. Make these traditional Chinese favourite with prawns: There is Prawn toasts that are deep fried and delicious, Prawn pot sticker dumplings that are super-easy to make and Honey prawns that your kids will love.